The holidays, they are nearly upon us. Thoughts of spending and busyness and stress probably flood your mind at the thought, especially when you consider the end-of-December holidays. Here’s something to remember, though: research shows experiences are more happiness-inducing than material goods. So, instead of running around like a crazy person, buying, buying, buying, why not carve out some time to spend with the small people you love the most? And what better way to do that than to craft something up together? Though the December holidays are more traditionally associated with crafting, there are lots of fun Thanksgiving themed crafts you can do. Plus, many of them will encourage your children to be grateful for what they have, and hey, any time you can combine fun and character-building, it's a win-win! 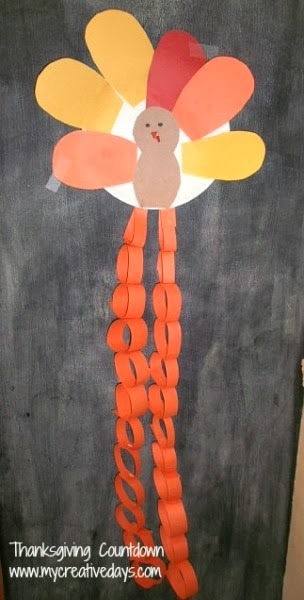 Using a paper plate and construction paper, you can make a cute turkey to help kids count down to Thanksgiving. If flour and baking sheets terrify you, never fear. 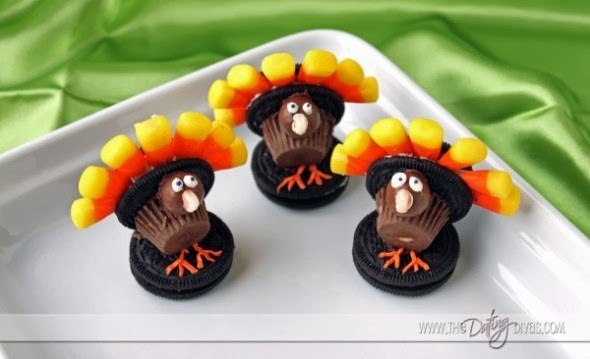 These adorable turkey cookies require no mixing or baking...you just need Oreos, peanut butter cups, candy corn, malted milk balls, and some frosting. Full directions are available at The Dating Divas. If you're a little more comfy with the idea of baking, perhaps turkey cupcakes would be more your style. 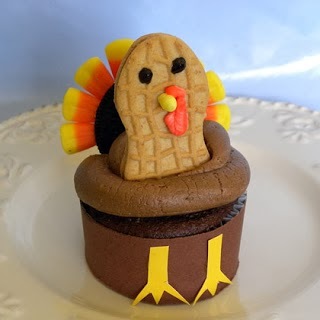 Check out these cute turkey cupcakes, made with Oreos, peanut butter cookies, and candy corn. To help kids get into the thankful mindset before the actual holiday arrives, make a thankful tree. Gather up some branches (spray paint them if you like), place them in a vase, and cut out leaf shapes from construction paper. Punch a hole in the top of each leaf so you can hang it from the tree. Here's a good example of a thankful tree. 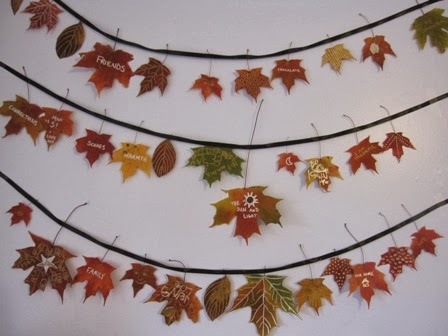 A pressed leaf garland is a really classy and beautiful way to display the things you're thankful for! 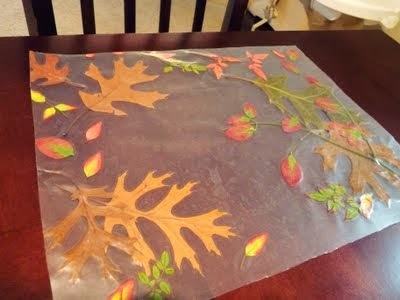 Press and dry colorful fall leaves, decorate with metallic pens, and hot glue to black satin ribbon. While it's great to help kids think of things they're thankful for, it's even better to teach them to express that thankfulness to others. So, why not send postcards to people your kids appreciate (teachers, grandparents, aunts, uncles, friends, neighbors)? You could do this with store-bought postcards, but making them with your kids is easy and will make the note more special. Here's how to make a basic postcard that your kids can decorate. This simple idea comes from Parents.com. Just divide a bulletin board into sections for each family member, and let everyone pin things that they're thankful for. Kids can cut out photos from magazines or catalogs, pin photos, draw what they're thankful for, or simply write out their thanks. If you live in an area with pine trees, pick up some pinecones and make some turkeys. 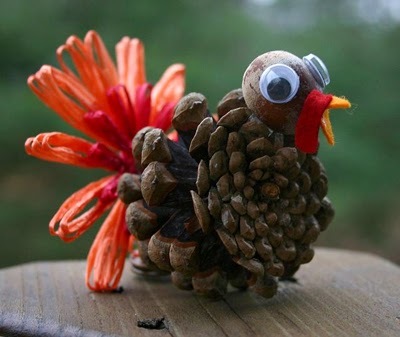 You can use pipe cleaners, tissue paper, leaves, or feathers to make the turkey's tail, and you'll need some googly eyes as well. Here's a great roundup of different pinecone turkey methods. Depending on what you use to decorate your turkeys, they may be almost completely compostable, making this a very eco-friendly craft. For a fun, slightly messy, but almost free craft, trace children's hands on paper plates, and glue on dried beans, popcorn, pretzels, pasta and rice to make a decorated turkey. Here's an example of what this could look like. When Thanksgiving is over, you can simply compost the masterpiece. You could use these for your big dinner, but there's no reason you'd have to wait until then to enjoy them. You can decorate cork placemats, use leaves to make prints on paper, or place leaves between sheets of wax paper and melt them together. Give some or all of these projects a try with your kids. Your kids will produce something beautiful and learn to practice the art of thankfulness, but even more importantly, as you spend time with your kids, you'll be giving them the gift of your presence. 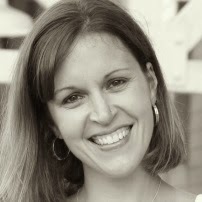 Kristen is an east coast wife, mom, and blogger behind The Frugal Girl. In an effort to inspire others to live frugally, Kristen contributes to the CareOne Debt Relief Services blog, a community that provides debt consolidation and money-saving advice.